Published Wednesday, November 28, 2018, OK personal/derivative use; link www.lovethatimage.com. 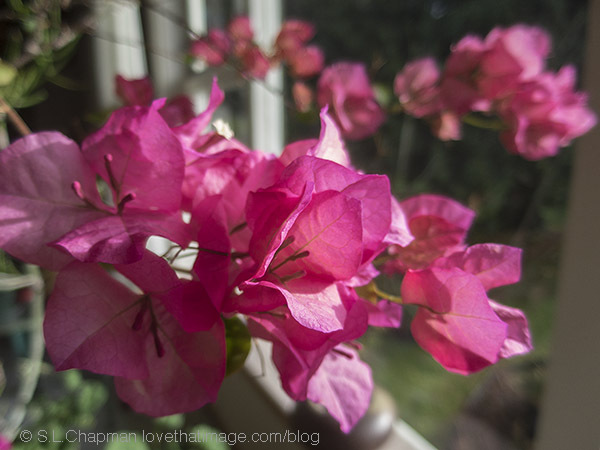 I have a standard bougainvillea plant (a little tree) that lives on my patio in the summer and indoors with the houseplants when it gets cold. 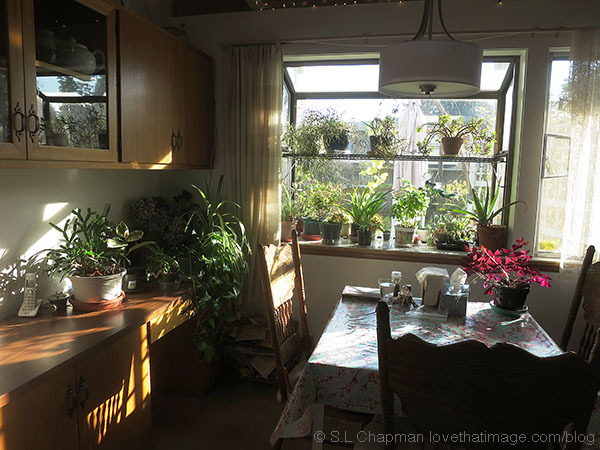 It loves the warm indoors temps, the big sunny south-facing window, and the extra plant food. Flowers! Connecting up with Through My Lens Monday, Macro Monday, Good Random Fun Monday, Ruby Tuesday 2, Our World Tuesday, Pictorial Tuesday, Tuesday’s Wordless Wednesday, Wordless Wednesday, Wednesday Around the World (WATW), Friday Bliss, Pink Saturday, My Sunday Photo, Shadow Shot Sunday 2, and Sunday Snap. Thanks for visiting here first. Published Tuesday, November 20, 2018, OK personal/derivative use; link www.lovethatimage.com. 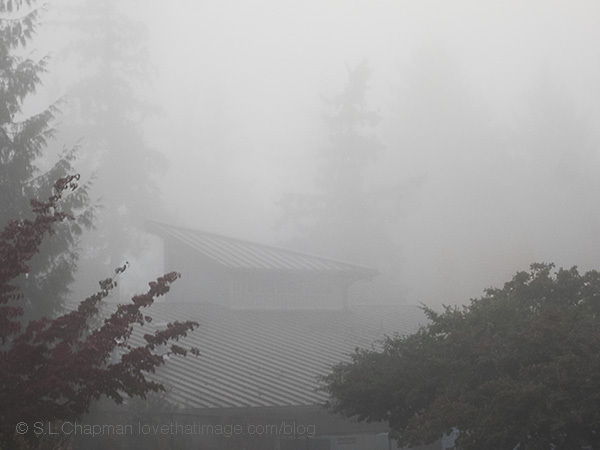 It was extremely foggy this autumn morning. There were crows outside my window. Also linking with Through My Lens Monday, Good Random Fun Monday, Our World Tuesday, Pictorial Tuesday, Tuesday’s Wordless Wednesday, Wordless Wednesday, Wednesday Around the World (WATW), Skywatch Friday, Friday Bliss, Pink Saturday, Camera Critters, My Sunday Photo, and Sunday Snap. Please come back again soon! 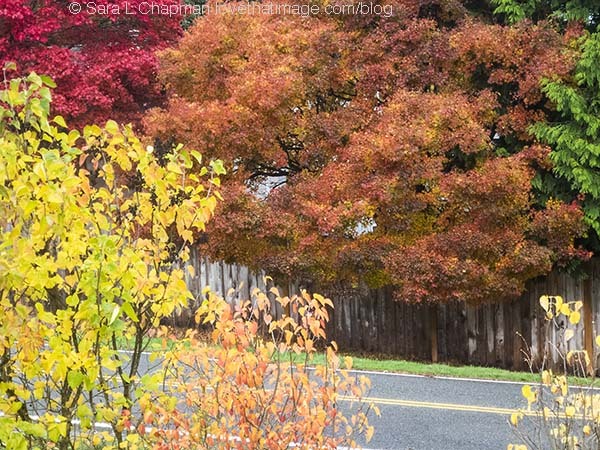 Published Monday, October 22, 2018, OK personal/derivative use; link www.lovethatimage.com. 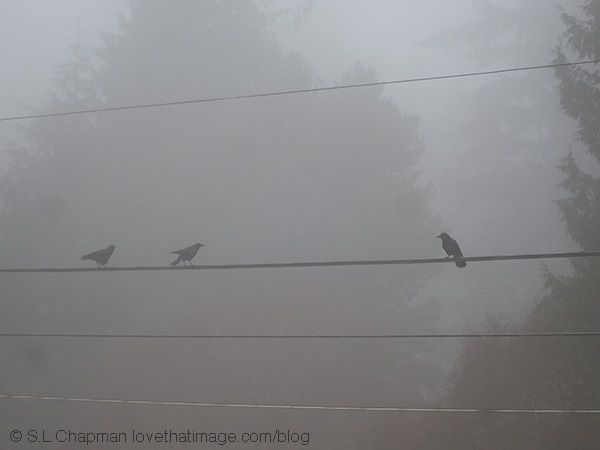 We had very unusual fog today, lasted the whole day. Here’s a local college campus building looking eternal. Also linking with Through My Lens Monday, Our World Tuesday, Ruby Tuesday 2, Pictorial Tuesday, Tuesday’s Wordless Wednesday, Wordless Wednesday, Wednesday Around the World (WATW), Skywatch Friday, Friday Bliss, Pink Saturday, My Sunday Photo, and Sunday Snap. Please come back soon! Published Wednesday, October 17, 2018, OK personal/derivative use; link www.lovethatimage.com. 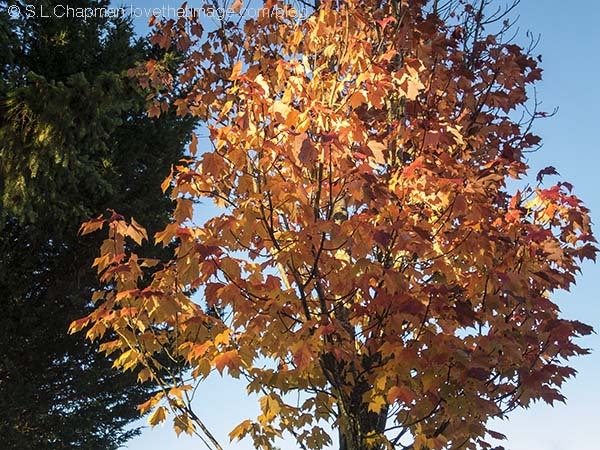 Maple tree + autumn + late afternoon sunshine = bliss. 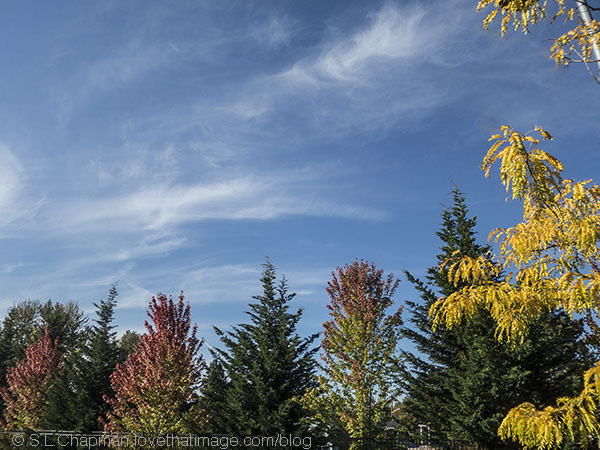 Fall color in maple leaves, with a very Pacific Northwest evergreen tree behind it. Also linking with Through My Lens Monday, Blue Monday, Ruby Tuesday 2, Our World Tuesday, Pictorial Tuesday, Tuesday’s Wordless Wednesday, Wordless Wednesday, Wednesday Around the World (WATW), Orange You Glad It’s Friday, Skywatch Friday, Friday Bliss, Pink Saturday, My Sunday Photo, Shadow Shot Sunday 2, and Sunday Snap. See you around here again soon, OK? Published Tuesday, October 16, 2018, OK personal/derivative use; link www.lovethatimage.com. I do post a lot of photos about Seattle’s Volunteer Park Conservatory, but here is a view that few are lucky enough to see. 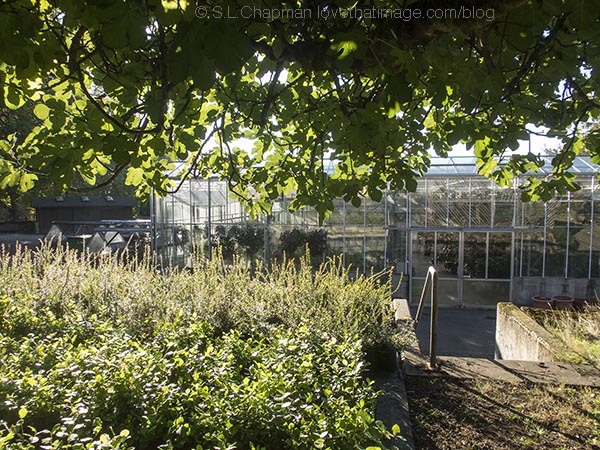 This glass structure is one of the support production greenhouses, seen on a sunny, early-fall afternoon last week. Volunteering has its perks! Also linking with Through My Lens Monday, Our World Tuesday, Pictorial Tuesday, Tuesday’s Wordless Wednesday, Wordless Wednesday, Wednesday Around the World (WATW), Friday Bliss, Weekend Reflections, Pink Saturday, My Sunday Photo, Shadow Shot Sunday 2, and Sunday Snap. Have a wonderful day and hope to see you around here again very soon. Published Monday, October 15, 2018, OK personal/derivative use; link www.lovethatimage.com. 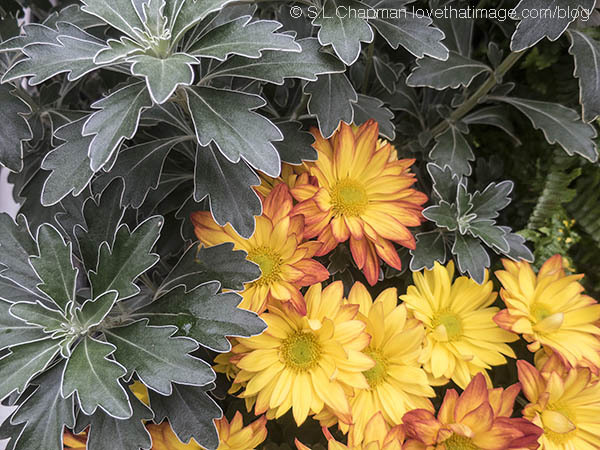 “Fancy” is not a very technical description, but I’ve never seen chrysanthemum leaves with a white border like this. 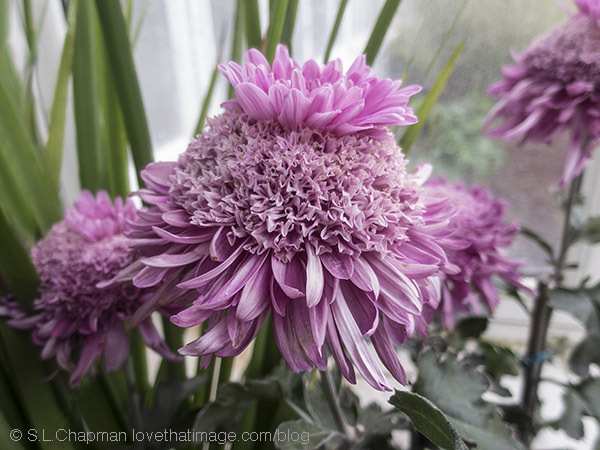 Pretty showy! Connecting with Through My Lens Monday, Macro Monday, Our World Tuesday, Pictorial Tuesday, Tuesday’s Wordless Wednesday, Tuesday’s Theme of the Week, Wordless Wednesday, Wednesday Around the World (WATW), Friday Bliss, Floral Friday, Orange You Glad It’s Friday, Pink Saturday, My Sunday Photo, and Sunday Snap. Have a wonderful day and hope to see you around here soon. Published Sunday, October 14, 2018, OK personal/derivative use; link www.lovethatimage.com. I’ve never seen one like this! Just in time to pique interest for the fabulous Mum Show coming up at the Conservatory in Volunteer Park, Seattle. Connecting with Through My Lens Monday, Macro Monday, Our World Tuesday, Pictorial Tuesday, Tuesday’s Wordless Wednesday, Wordless Wednesday, Wednesday Around the World (WATW), Friday Bliss, Floral Friday, Pink Saturday, My Sunday Photo, and Sunday Snap. Have a wonderful day and hope to see you around here soon. Published Friday, October 12, 2018, OK personal/derivative use; link www.lovethatimage.com. 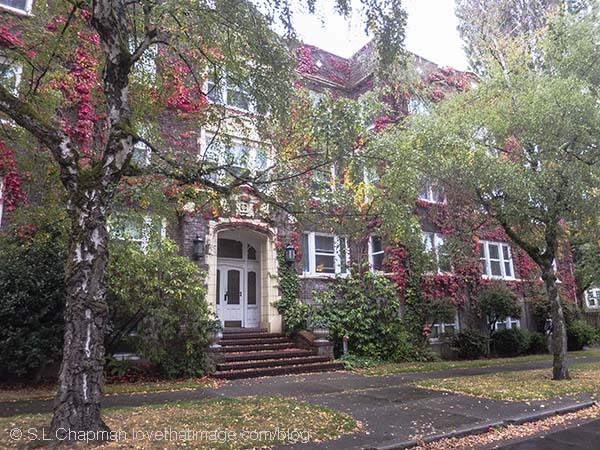 A fine old building in Seattle’s Capitol Hill neighborhood is showing some fall color. Also linking with Through My Lens Monday, Ruby Tuesday 2, Our World Tuesday, Pictorial Tuesday, Tuesday’s Wordless Wednesday, Wordless Wednesday, Wednesday Around the World (WATW), Friday Bliss, Pink Saturday, My Sunday Photo, and Sunday Snap. Have a wonderful day and hope to see you around here again very soon. Published Sunday, October 7, 2018, OK personal/derivative use; link www.lovethatimage.com. Last week there was some sunshine. It will come again! Also linking with Through My Lens Monday, Blue Monday, Ruby Tuesday 2, Our World Tuesday, Pictorial Tuesday, Tuesday’s Wordless Wednesday, Wordless Wednesday, Wednesday Around the World (WATW), Friday Bliss, Skywatch Friday, Pink Saturday, My Sunday Photo, and Sunday Snap. Have a wonderful day and hope to see you around here again very soon. Published Monday, September 24, 2018, OK personal/derivative use; link www.lovethatimage.com. Our backyard grape vine is doing pretty well this year. We might get ten bunches! The raccoons decimated the plums but haven’t taken all of these (yet). So sweet and delicious. If you can, plant a grapevine. 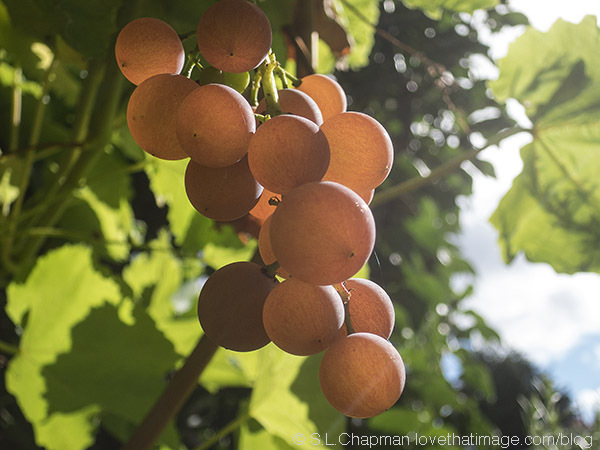 Backyard interlaken seedless, red, table grape vine, ripening well in Seattle’s short summer. Also linking with Through My Lens Monday, Macro Monday, Ruby Tuesday 2, Our World Tuesday, Pictorial Tuesday, Tuesday’s Wordless Wednesday, Wordless Wednesday, Wednesday Around the World (WATW), Friday Bliss, Skywatch Friday, Orange You Glad It’s Friday, Pink Saturday, My Sunday Photo, Shadow Shot Sunday 2, and Sunday Snap. Have a wonderful day and hope to see you around here again soon.